If you turn on your iPhone/iPad and get the white Apple logo screen and nothing happens after that then you have become the victim of white screen of death. Now, it literally doesn't mean the death of your device but for a certain extend it is dead. Luckily, a few good solutions could help to fix this issue and one of the ways is to update firmware of your device and do a fresh install of OS on your iPhone/iPad. In short, we will have to reset the iPhone or iPad to make it work like a normal device again. We will be using the following methods. Make sure to follow the instruction and at the end of this tutorial, your phone should be fixed. When something goes wrong on your iPhone, iPad or iPod, the first method we can think up is to restore the iPhone as new. This is a quite effective method for all system related problems. However, you should make sure you have backup. If not, then I suggest moving to Method 2 instead becasue all data on the iPhone will be removed after restore. 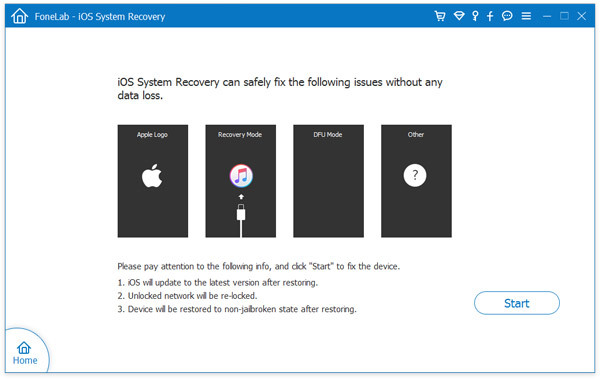 Below are the steps on how to restore iPhone from iTunes. Step 1: Connect your iPhone/iPhone to PC using a USB data cable. Step 2: Press Home + Power button together until the phone restarts and leave the power button. Step 3: Keep holding the Home button as soon the phone resets. Step 4: This should launch iTunes on your computer automatically and it should show a message that says "There is a problem with the iPhone that requires it to be updated or restored". Step 5: Now click on "Restore" from the Summary menu. Step 6: Next, click on "Restore and Update" when you are asked and wait until the operation is successfully finished. This may take several minutes, so you will have to wait patiently. The device will go to factory state before shipment. All data on that device will be deleted and it takes a lot of effort to recover them. So be careful with this method. If you worried about it, you can use Method 2 to fix the problem. To overcome all these cons in Method 1, it is advised to use a professional tool that is proven to solve this issue. 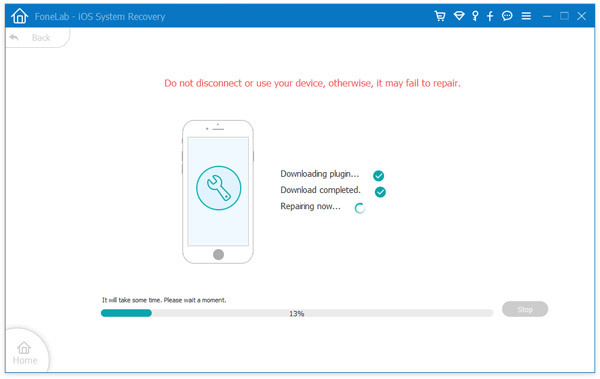 In this part, we will be using Androidphonesoft iOS System Recovery to fix system issues like white screen with apple logo, stuck in recovery mode and other system related issues. The instructions are displayed on the screen so just follow the guidelines and you will get the device back to normal in a short time. Firstly, you need to download this program on a PC or Mac. Next, you should install it on the computer and run the program to check the main interface. This software provides tons of features and you can navigate through each options if you like. But for this tutorial, we will be choosing More Tools -> System Recovery to fix the issue. 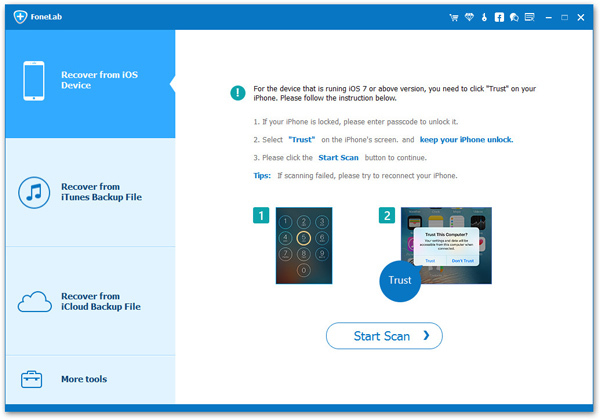 Now, you must connect the iPhone or iPad to PC and let the software detect your device. It may take some time if you are connecting for the first time. Next you should click on "Start" after the device is recognized by it. Next, press Home + Power button on your iPhone/iPad until the phone resets and keep holding the Home button to enter into DFU mode. On the next page, you will be asked to put your device information. Make sure to enter the correct details to download the right firmware for your device. After filling in the details, click on "Download" and it should start downloading the firmware. Please note that these files are bigger in size, so it may take some time depending on your network connection. After finishing the downloading process, the software will automatically attempt to repair your device and start the repairing process. You will be able to see this following screen if everything is going smoothly. After the repairing process is done, you should be able to see the following screen and you can start the iPhone/iPad normally. 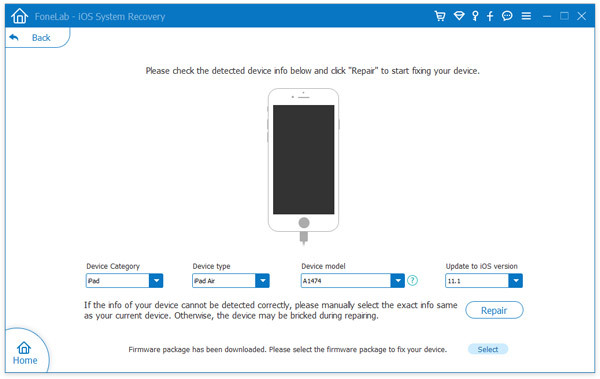 This should completely repair your iPhone/iPad and you can restart the device normally. This should totally fix the issue and you won't be able to see the white Apple logo screen anymore. Make sure to keep your phone connected the entire time while the process is taking place to avoid any interruption.